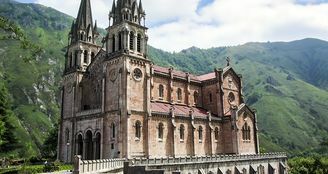 An unmissable visit, The Virgin of Covadonga, or La Santina, the patron of Asturias, is not just a place of religious pilgrimage but a spectacle in plain nature. The Virgin of Covadonga is to be found in a cave-chapel within the mountain and, alongside it, sits the Basilica with its statue of Pelagius, Visigothic nobleman and founder of the Kingdom of Asturias. 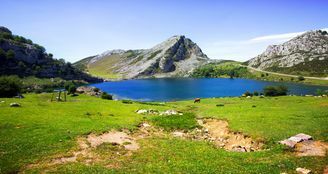 From Covadonga one can also visit the glacial Lakes Enol and Ercina in the Picos de Europa. 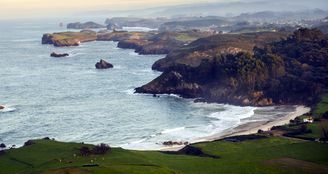 Between mountain and sea, Asturias is a paradise of whatever you're looking for. One third of its surface is protected and it boasts no fewer than six UNESCO-declared Biosphere Reserves: Oscos, Somiedo, Fuentes del Narcea, Degaña e Ibias, Las Ubiñas-La Mesa, Redes or, the most popular, Picos de Europa. 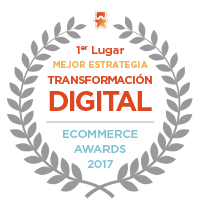 Aside from National Parks, also worth visiting are the rías of Eo and Villaviciosa or the caves of Las Caldas, Del Sidrón, Lloviu and Andina. In these and in dozens of other protected spaces, the visitor can avail of walking and mountaineering routes or brave a climb to the peaks. A coastline of 345 kilometres, dotted with more than two hundred different beaches, expansive and sandy, stony or intimate coves... each, according to its features, perfect for swimming, water sports or fishing. Everyone has their own favourite, but some of the best known are those of Llanes, Cadavedo, Andrín, Gulpiyuri's interior beach, Aguilar, del Silencio or Rodiles. There is no better way of discovering them than a route through the seaside villages of the coast, with their old town centres, fishing village smells, cliffs and sea views. Cudillero, Llanes, Luanco, Navia, Luarca and Ribadesella are some of the most visited.